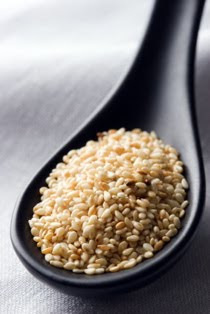 Tahini is a delicious spread made from ground sesame seeds. It is often added to hummus and other mediterranean dips. It is packed full of Calcium (who says you can only get calcium from milk?! ), Copper, and Magnesium. Tahini is also full of phytosterols, which are believed to reduce blood levels of cholesterol, enhance the immune response and decrease the risk of certain cancers. Tahini can be used as a substitute for peanut butter. Because peanuts are highly allergenic, it is recommended that you do not introduce peanut butter into your child’s diet until he/she is 2-3 years old. Spread tahini on a brown rice cake or spoon it straight out of the jar for a protein-packed snack. Your little one may be a bit weary at first, but will soon learn to love it!! Also a great salad dressing (see below). If the consistency is too wet, add in some almond meal or ground flax so that they hold together better. Roll into balls and then roll in organic unsweetened coconut flakes or puffed rice (broken rice cakes work well). Freeze. This will make quite a few tahini balls. Throw them in a tupperware for a healthy snack or a sweet treat on the go. These are delicious! Reminscent of peanut butter cookies, but made with healthy nut and seed butters! 1. Preheat oven to 350 F. In a small bowl, mix together all of the dry ingredients and set aside. With an electric mixer, blend the two butters together until smooth. If they become so thick that the mixed has trouble moving through them, add water, 1 tbsp at a time, but no more than 4 tbsps. 2. Add the remaining wet ingredients, and beat on low until blended. 3. Add the dry ingredients all at once, and beat together until well blended. 4. Drop by tablespoonfuls onto an oiled baking sheet. Bake until the cookies are lightly brown. 10-12 minutes. Mix tahini with a little rice vinegar or white wine vinegar. Add lemon, ground pepper, and a bit of water for a tasty way to dress your greens! Don’t be afraid to spice it up!